In today’s world, many schools experimenting with, or building on, classroom education programs, like blended learning, often get so excited about the new technology available that they may neglect the underlying effectiveness of it for the program, and ultimately student and classroom performance. As an administrator or teacher, it can be difficult to evaluate the efforts to use technology to better support programs like blended learning in classrooms effectively; in other words, it can be tough determining whether a program is being supported by the technology, or if the classroom is merely tech-rich. Researchers have developed models or rubrics to evaluate effective technology use in K-12, and you may have heard of TPACK, RAT, or SAMR. I won’t describe all the models here, but I want to introduce one model being used called PIC-RAT. It expands on a well-known rubric by incorporating a very simplified version of Bloom’s taxonomy (PIC) with the often used RAT framework (Hughes, Thomas & Scharber, 2006). 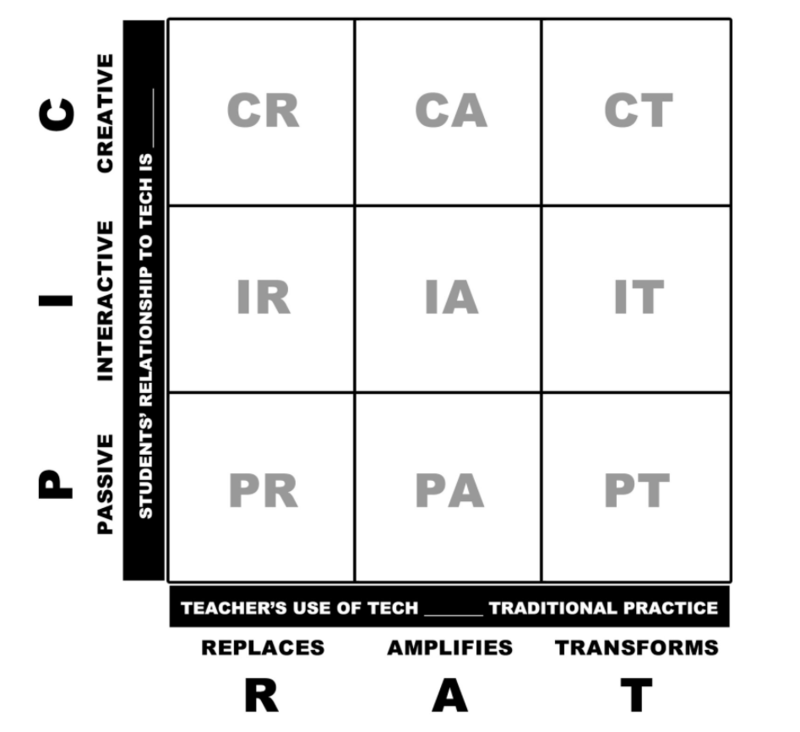 In a blended context, school teachers and leaders are constantly trying to move the use of technology to the Amplify and Transform side of the matrix, using technology in ways that benefit teachers and students. As part of data-driven personalization efforts integrated in a blended program, the use of personalized learning software, such as Lexia Reading, Khan Academy, iRead, iReady, or any number of software types, have the potential to Amplify and Transform traditional practice if used effectively by teachers. Another way that K-12 schools can use technology effectively in blended programs is by ensuring students use technology in Interactive and Creative ways. One example is by teaching computational thinking skills, or more specifically, how to code to young kids. Scratch is one technology that does this, and in the coming years there will likely be more options out there that help students think in ways that prepare them to build technology tools of the future. If you notice that a student’s experience with technology is mostly Passive, or an activity is mostly Replacing traditional practice, think of tools or ways that might move you higher and further on the scale. For example, instead of having students just watch a video at home about a particular topic for homework (passive), you might consider using EdPuzzle, which inserts questions for comprehension in the middle of the video and makes the experience Interactive; it also Transforms the experience when you as the teacher view student scores before the next class period and prepare to teach with that data in mind. A teacher uses PowerPoint as part of her lecture. Students are asked to keep an online journal in a blog. Students pass a touch-enabled tablet around the room and write a collaborative poem. Students play an online role-playing game about John Smith and Pocahontas. Students write answers to math problems on an interactive whiteboard. Students organize geometric shapes in patterns on an iPad. A teacher creates a video to introduce herself to her students on the first day. Students make an animated video to tell a story. A teacher designs a WebQuest (inquiry-driven online lesson) for students to complete on their own time. A teacher uses Facebook to remind her students about homework. If you want a more detailed explanation of PIC-RAT, please watch this video. We have provided several possible answers for certain examples. There can be uses of technology that do not neatly fall into one category or another in the PIC-RAT model, because contextual factors may change the nature of the activity. If you disagree with some of the answers provided, this could lead to a great discussion with fellow blended teachers. About the author: Emily Pulham is a doctoral candidate in Instructional Psychology and Technology at Brigham Young University with a bachelors in vocal performance. Emily is also a current Measurement Fellow at The Learning Accelerator.